Untuk kegunaan lain, sila lihat Tearfate/masa (nyahkekaburan). There are two distinct views on the meaning of time. One view is that time is part of the fundamental structure of the universe, a dimension in which events occur in sequence. This is the realist view, to which Sir Isaac Newton  subscribed, in which time itself is something that can be measured. A contrasting view is that time is part of the fundamental intellectual structure (together with space and number) within which we sequence events, quantify the duration of events and the intervals between them, and compare the motions of objects. In this view, time does not refer to any kind of entity that "flows", that objects "move through", or that is a "container" for events. This view is in the tradition of Gottfried Leibniz and Immanuel Kant, in which time, rather than being an objective thing to be measured, is part of the mental measuring system. The question, perhaps overly simplified and allowing for no middle ground, is thus: is time a "real thing" that is "all around us", or is it nothing more than a way of speaking about and measuring events? Many fields avoid the problem of defining time itself by using operational definitions that specify the units of measurement that quantify time. Regularly recurring events and objects with apparent periodic motion have long served as standards for units of time. Examples are the apparent motion of the sun across the sky, the phases of the moon, and the swing of a pendulum. Time has long been a major subject of science, philosophy and art. The measurement of time has also occupied scientists and technologists, and was a prime motivation in astronomy. Time is also a matter of significant social importance, having economic value ("time is money") as well as personal value, due to an awareness of the limited time in each day and in human lifespans. This article looks at some of the main philosophical and scientific issues relating to time. 4.5 Time and the "Big Bang"
Carilah time dalam Wiktionary, kamus bebas. According to the Oxford English Corpus, the word 'time' comes top in the list of most common nouns in the English language. The Latin word for time, tempus, came from the Greek temnein meaning "to cut" (same root for atomos άτομος meaning "indivisible"), thus signifying a division of the flowing duration . Time is currently one of the few fundamental quantities. These are quantities which cannot be defined via other quantities because there is nothing more fundamental than what is presently known. Thus, similar to definition of other fundamental quantities (like space and mass), time is defined via measurement. The origins of our current measurement system go back to the Sumerian civilization of approximately 2000 BCE. This is known as the Sumerian Sexagesimal System based on the number 60. 60 seconds in a minute, 60 minutes in an hour - and possibly a calendar with 360 (60x6) days in a year (with a few more days added on). Twelve also features prominently, with roughly 12 hours of day and 12 of night, and roughly 12 months in a year (especially in a 360 day year). Horizontal sundial in Taganrog (1833). The most accurate timekeeping devices of the ancient world were the waterclock or clepsydra, first found in Egypt. A waterclock was found in the tomb of pharaoh Amenhotep I (1525 - 1504 BCE). Waterclocks were used in Alexandria, and then worldwide, for example in Greece, from c.400 BCE. They could be used to measure the hours even at night, but required manual timekeeping to replenish the flow of water. Plato is said to have invented a water-based alarm clock. It depended on the nightly overflow of a vessel containing lead balls, which would float in a columnar vat. The vat would hold an increasing supply of water supplied by a cistern. Eventually the vessel would float high enough to tip over. The lead balls would then cascade onto a copper platter. The resultant clangor would then awaken his students at the Academy (378 BCE). The Greeks and Chaldeans regularly maintained timekeeping records as an essential part of their astronomical observations. In particular, Arab engineers improved on the use of waterclocks up to the Middle Ages. The hourglass uses the flow of sand to measure the flow of time. They were used in navigation. Ferdinand Magellan used 18 glasses on each ship for his circumnavigation of the globe (1522). The English word clock actually comes from French, Latin, and German words that mean bell. The passage of the hours at sea were marked by bells, and denoted the time (see ship's bells). The hours were marked by bells in the abbeys as well as at sea. Incense sticks and candles were, and are, commonly used to measure time in temples and churches across the globe. Waterclocks, and later, mechanical clocks, were used to mark the events of the abbeys and monasteries of the Middle Ages. Richard of Wallingford (1292–1336), abbot of St. Alban's abbey, famously built a mechanical clock as an astronomical orrery about 1330,. The most common devices in day-to-day life are the clock, for periods less than a day, and the calendar, for periods longer than a day. Clocks can range from watches, to more exotic varieties such as the Clock of the Long Now. They can be driven by a variety of means, including gravity, springs, and various forms of electrical power, and regulated by a variety of means such as a pendulum. There are also a variety of different calendars, for example the Lunar calendar and the Solar calendar, although the Gregorian calendar is the most commonly used. A chronometer is a timekeeper precise enough to be used as a portable time standard, needed to determine longitude by means of celestial navigation. Nowadays over 1,000,000 "Officially Certified Chronometer" certificates, mostly for mechanical wrist-chronometers (wristwatches) with sprung balance oscillators, are being delivered each year, after passing the COSC's most severe tests and being singly identified by an officially recorded individual serial number. According to COSC, a chronometer is a high-precision watch capable of displaying the seconds and housing a movement that has been tested over several days, in different positions, and at different temperatures, by an official, neutral body (COSC). Each movement is individually tested for several consecutive days, in five positions and at three temperatures. Any watch with the denomination "chronometer" is provided with a certified movement. The most accurate type of timekeeping device is currently the atomic clock, which are used to calibrate other clock and timekeeping instruments. Today, the GPS global positioning systems in coordination with the NTP network time protocol can be used to synchronize timekeeping systems across the globe. The measurement of time is so critical to the functioning of modern societies that it is coordinated at an international level. The basis for scientific time is a continuous count of seconds based on atomic clocks around the world, known as the International Atomic Time (TAI). This is the yardstick for other time scales, including Coordinated Universal Time (UTC), which is the basis for civil time. Earth is split up into a number of time zones. Most time zones are exactly one hour apart, and by convention compute their local time as an offset from Greenwich Mean Time. Another form of time measurement consists of studying the past. Events in the past can be ordered in a sequence (creating a chronology), and be put into chronological groups (periodization). One of the most important systems of periodization is geologic time, which is a system of periodizing the events that shaped the Earth and its life. Chronology, periodization, and interpretation of the past are together known as the study of history. The earliest recorded philosophy of time was expounded by Ptahhotep, who lived c.2650 -2600 BC said: "Do not lessen the time of following desire, for the wasting of time is an abomination to the spirit." In the Old Testament book Ecclesiastes, traditionally thought to have been written by King Solomon (970-928 BC), time was regarded as a medium for the passage of predestined events. Around 500 BC Heraclitus, a fatalist, held that the passage of time and the future both lay beyond the possibility of human influence: "Everything flows and nothing abides; everything gives way and nothing stays fixed. You cannot step twice into the same river, for other waters and yet others, go flowing on. Time is a child, moving counters in a game; the royal power is a child's." Newton believed time and space form a container for events, which is as real as the objects it contains. In contrast to Newton's belief in absolute space, and closely related to Kantian time, Leibniz believed that time and space are a conceptual apparatus describing the interrelations between events. The differences between Leibniz's and Newton's interpretations came to a head in the famous Leibniz-Clark Correspondence. Leibniz thought of time as a fundamental part of an abstract conceptual framework, together with space and number, within which we sequence events, quantify their duration, and compare the motions of objects. In this view, time does not refer to any kind of entity that "flows," that objects "move through," or that is a "container" for events. Immanuel Kant, in the Critique of Pure Reason, described time as an a priori intuition that allows us (together with the other a priori intuition, space) to comprehend sense experience. With Kant, neither space nor time are conceived as substances, but rather both are elements of a systematic mental framework necessarily structuring the experiences of any rational agent, or observing subject. Spatial measurements are used to quantify how far apart objects are, and temporal measurements are used to quantify how far apart events occur. Similarly, Schopenhauer stated in the preface to his On the Will in Nature that "Time is the condition of the possibility of succession." In Existentialism, time is considered fundamental to the question of being, in particular by the philosopher Martin Heidegger. See Ontology. In 5th century BC Greece, Antiphon the Sophist, in a fragment preserved from his chief work On Truth held that: "Time is not a reality (hupostasis), but a concept (noêma) or a measure (metron)." Parmenides went further, maintaining that time, motion, and change were illusions, leading to Zeno's paradoxes (Zeno was a follower of Parmenides). Writers such as J. M. E. McTaggart in his 1908 The Unreality of Time have argued that time is an illusion (see also The flow of time). In general, the Judaeo-Christian concept, based on the Bible, is that time is linear, with a beginning, the act of creation by God. The Christian view assumes also an end, the eschaton, expected to happen when Christ returns to earth in the Second Coming to judge the living and the dead. This will be the consummation of the world and time. St Augustine's City of God was the first developed application of this concept to world history. The Christian view is that God and the supernatural world are outside time and exist in eternity. This view relies on interpretation however, for some Jewish and Christian sects believe time may in fact be cyclical.Templat:Cite needed It is also possible to see time as having more than one dimension. In this view, over time the universe branches into multiple alternative universes where different events have occurred. This view has not been scientifically verified. The dharmic religions such as Buddhism and Hinduism, have a concept of a wheel of time, that regards time as cyclical and quantic consisting of repeating ages that happen to every being of the Universe between birth and extinction. In recent years this cyclical vision of time has been embraced by theorists of quantic space-time and systems theory. A tesseract, a cube in 3 dimensions extended to a fourth, as a description of time; adhering to defined finite bounds, all possibilities for this configuration are conceptually representable. Modern physics views the curvature of spacetime around an object as much a feature of that object as are its mass and volume. Time has historically been closely related with space, the two together comprising spacetime in Einstein's special relativity and general relativity. According to these theories, the concept of time depends on the spatial reference frame of the observer(s), and the human perception as well as the measurement by instruments such as clocks are different for observers in relative motion. Even the temporal order of events can change, but the past and future are defined by the backward and forward light cones, which never change. The past is the set of events that can send light signals to the observer, the future the events to which she can send light signals. All else is the present and within that set of events the very time-order differs for different observers. Block time consists of an unchanging four-dimensional spacetime. This does away with the idea of the past, present and future. Planck time (~ 5.4 × 10−44 seconds) is the unit of time in the system of natural units known as Planck units. According to current theory, it is the smallest unit of time that could ever be measured. Time quanta is a hypothetical concept. In the modern quantum theory (Standard Model of particle physics) and in General relativity time is not quantized. Einstein said that the only reason for time is so that everything does not happen at once. In this regard, Einstein said that time was basically what a clock reads; the clock can be any action or change, like the movement of the sun. Einstein showed that people traveling at different speeds will measure different times for events and different distances between objects, though these differences are minute unless one is traveling at a speed close to that of light. Many subatomic particles exist for only a fixed fraction of a second in a lab relatively at rest, but some that travel close to the speed of light can be measured to travel further and survive longer than expected (a muon is one example). According to the special theory of relativity, in the high-speed particle's frame of reference, it exists, on the average, for a standard amount of time known as its mean lifetime, and the distance it travels in that time is zero, because its velocity is zero. Relative to a frame of reference at rest, time seems to "slow down" for the particle. Relative to the high-speed particle, distances seems to shorten. Even in Newtonian terms time may be considered the fourth dimension of motion; but Einstein showed how both temporal and spatial dimensions can be altered (or "warped") by high-speed motion. Time appears to have a direction to us - the past lies behind us, and is fixed and incommutable, while the future lies ahead and is not necessarily fixed. Yet the majority of the laws of physics don't provide this arrow of time. The exceptions include the Second law of thermodynamics, which states that entropy must increase over time (see Entropy (arrow of time)); the cosmological arrow of time, which points away from the Big Bang, and the radiative arrow of time, caused by light only traveling forwards in time. In particle physics, there is also the weak arrow of time, from CPT symmetry, and also measurement in quantum mechanics (see Measurement in quantum mechanics). According to some of the latest scientific theories, time began with the Big Bang. Stephen Hawking has commented that statements about what happened "before" time began are self-contradictory, and thus without meaning. Other theorists have contended that even if there were another time frame "before" the Big Bang, no information from events then would be accessible to us. Scientists have come to some agreement on descriptions of events that happened 10-35 seconds after the Big Bang, but generally agree that descriptions about what happened before one Planck time after the Big Bang will likely remain pure speculations. Time travel is the concept of moving backward or forward to different points in time, in a manner analogous to moving through space. Additionally, some interpretations of time travel take the form of travel between parallel realities or universes. A central problem with time travel is that of causality - causes preceding effects - which has given rise to a number of paradoxes (see grandfather paradox). Different people may judge identical lengths of time quite differently. Time can "fly"; that is, a long period of time can seem to go by very quickly. 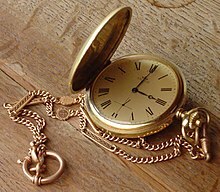 Likewise, time can seem to "drag," as in when one performs a boring task. The psychologist Jean Piaget called this form of time perception "lived time." Time also appears to pass more quickly as one gets older. For example, a year for a five-year-old child is 20% of his entire life so far, however for a 50 year old adult a year is only 2% of his entire life so far; so with increasing age, each segment of time is a decreasing percentage of the person's total experience. Altered states of consciousness are sometimes characterised by a different estimation of time. Some psychoactive substances--such as entheogens--may also dramatically alter a person's temporal judgement. When viewed under the influence of such substances as LSD, magic mushrooms and peyote, a clock may appear to be a strange reference point and a useless tool for measuring the passage of events as it does not correlate with the user's experience. At higher doses, time may appear to slow down, stop, speed up and even go backward when under the influence of these agents. A typical thought might be "I can't believe it's only 8 o'clock, but then again, what does 8 o'clock mean?" As the boundaries for experiencing time are removed, so is its relevance. Many users claim this unbounded timelessness feels like a glimpse into spiritual infinity. To imagine that one exists somewhere "outside" of time is one of the hallmark experiences of a psychedelic voyage. Marijuana may also distort the perception of time, although, to a lesser degree than psychedelics. The practice of meditation, central to all Buddhist traditions, takes as its goal the reflection of the mind back upon itself, thus altering the subjective experience of time; the so called, 'entering the now', or 'the moment'. In explaining his theory of relativity, Albert Einstein is often quoted as saying that although sitting next to a pretty girl for an hour feels like a minute, placing one's hand on a hot stove for a minute feels like an hour. This is intended to introduce the listener to the concept of the interval between two events being perceived differently by different observers. ^ "Oxford English Corpus". Dicapai 2006-06-23. ^ a b Organisation Intergouvernementale de la Convention du Métre (1998). The International System of Units (SI), 7th Edition (PDF). Dicapai 2006-06-13. ^ Newton, Isaac (1726). The Principia, 3rd edition. Translated by I. Bernard Cohen and Anne Whitman, University of California Press, Berkeley, 1999. Galison, Peter (1992). Einstein's Clocks and Poincaré's Maps: Empires of Time. Prerau, David (2005). Seize the Daylight: The Curious and Contentious Story of Daylight Saving Time. Thunder's Mouth Press. ISBN 1-56025-655-9. Rovelli, Carlo (2006). What is time, what space?. Di Renzo Editore, Roma,. The Experience and Perception of Time from the Stanford Encyclopedia of Philosophy. Is there a defensible argument for the non-existence of time?